An aneurysm is a ballooning or dilation of a blood vessel to more than 150% of its normal size, which is generally caused by damage to the lining of the blood vessel wall. The most common artery to develop an aneurysm is the aorta, followed by the iliac artery, femoral artery, and popliteal artery. Less commonly, aneurysms can develop in the carotid, subclavian, renal, and mesenteric arteries. If left untreated, aneurysms can rupture or burst, which can cause serious bleeding and the potential for a life threatening situation, while some aneurysms may also create blood clots or lead to a stroke. At Tenet Florida Cardiovascular Care, we treat all forms of aneurysms; however, the remainder of this section will focus on aortic aneurysms. Arising directly from the heart and extending through the chest into the abdomen, the aorta is the largest artery in the body and supplies all of the remaining arteries with blood. Aortic aneurysms may form anywhere along the aorta, but are most commonly seen in the abdomen—abdominal aortic aneurysm (AAA)—and the upper body or chest region—thoracic aortic aneurysm (TAA). The major concern about aortic aneurysms is that they will rupture, leading to serious bleeding and the possibility of death. There are more than 1.5 million people living in the United States with an AAA, yet only 15% are regularly diagnosed. Ruptured AAA is the 15th most common cause of death in the U.S., with the risk of rupture related to the size of the aneurysm. In short, the larger the aneurysm, the greater the risk of rupture. Age- Aneurysm formation typically occurs over a long period of time and is more prevalent as we age. It is uncommon for someone below the age of 50 to have an AAA; however, the incidence increases as a person ages beyond 65 years. Women typically develop aneurysms at a later age than men. Smoking- Tobacco smoking significantly increases the risk of aneurysm formation and is one of the most common causes of AAA. Family History- There is evidence that some aneurysms are inherited. If you have a first-degree relative (parent, grandparent, or sibling) with an AAA, your chance of developing an aneurysm increases 3 to 4 times. It appears to be linked to the X-chromosome, which means that if your mother’s side of the family has a history of aneurysms, it is important to make sure your doctor is aware. Some inherited disorders such as Marfan Syndrome, Loey’s-Dietz Syndrome, and Ehlors-Danlos may cause aneurysms to develop at a young age. High Blood Pressure- If poorly controlled, this significantly increases your chances of developing an aneurysm. Gender- Men are more likely to develop aneurysms than women. Race- Caucasian individuals have the highest risk of developing AAA. COPD- Can significantly increase the risk aneurysm formation. Large aneurysms may be felt as a bulging, pulsating mass in the abdomen. Persistent abdominal (AAA) or left sided chest pain (TAA) can occur with large, rapidly growing or ruptured aneurysms. In addition, patients can experience back pain either between the shoulder blades (TAA) or middle lower back (AAA). However, most aortic aneurysms are silent and do not cause symptoms, which can make diagnosis difficult. As previously noted, most aneurysms are silent and do not cause symptoms until they are rapidly expanding or ruptured. Therefore, in order to identify aneurysms before they have the opportunity to cause harm, it is critical to screen for aneurysms in patients with the aforementioned risk factors. Since large aneurysms can be felt “pulsating” in the stomach, all patients over the age of 50 should have their abdomens palpated at each yearly physical or checkup. However, the best way to screen for AAA is through abdominal duplex ultrasound, which is a painless, non-invasive examination. Medicare will pay for a one-time AAA screening for anyone over the age of 65 who has ever smoked. In addition, those who have a significant history of high blood pressure and either smoking or COPD should consider undergoing ultrasound evaluation if they are 65 years or older. Those with a family history of aneurysms should also be screened once they turn 50 years old. If an aneurysm is detected on physical examination or ultrasound, further testing with a CT scan or MRI may be necessary to determine the aneurysm’s size and location in the body. The goal of treatment is to prevent aneurysm rupture; however, it’s important to note that not all aneurysms need to be treated since many may simply require close observation. Treatment of an aortic aneurysm depends upon the size of the aneurysm, rate of aneurysm growth, and whether the patient is experiencing any symptoms. In general, all of these factors can combine to predict an aneurysm rupture. Aneurysms below 4.5 cm can be managed non-operatively and observed closely; however, any aneurysm greater than 5 cm in men and 4.5 cm in women should make the patient a candidate for treatment. Since aneurysms above those sizes will greatly increase the risk of rupture, 60% of people will need repair within three to five years. Still, when contemplating repair, there are many factors to be considered, including the patient’s overall health status, location of the aneurysm, risk of surgery, patient preference, and other health issues. There are two ways to repair aortic aneurysms: 1) With open surgery and 2) with minimally invasive endovascular repair that is completed through an “endograft,” which is a stent inserted through a small puncture in the groin. The method of repair should be personalized for each individual, so it’s important that patients discuss their options with a qualified vascular surgeon. At Tenet Florida Cardiovascular Care, we favor a minimally invasive endovascular approach whenever feasible; however, there are some instances in which we recommend open surgery because it may be more beneficial to the patient. 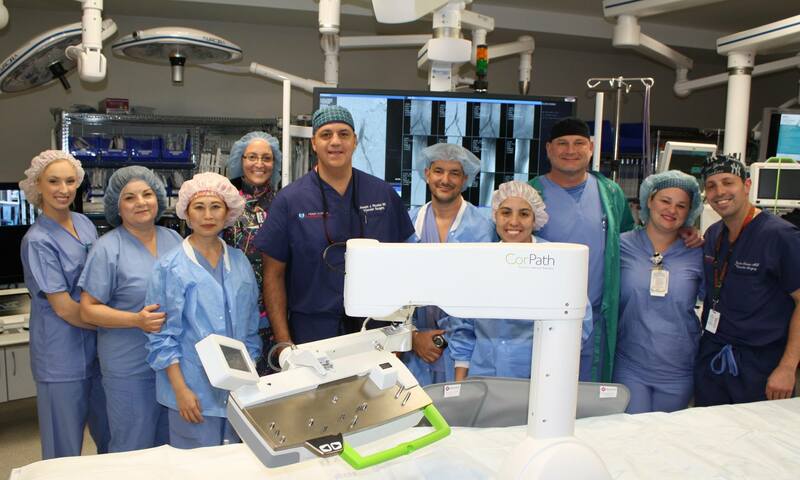 For high-risk patients who cannot undergo open surgery and are dealing with a thoracoabdominal or complex aortic aneurysm which, cannot be treated by conventional endovascular repair, Dr. Ricotta is the first surgeon in the United States with FDA approval to create and implant modified endografts. These endografts allow the patient to be treated with a unique, innovative approach that does not require an incision. Following repair, patients are required to be monitored with ultrasound or CT scans at regular visits to the office every six to twelve months. "I travel 600 miles round trip to see Dr. Ricotta. I have seen other specialist but none as thorough, knowledgeable, and takes time with you so you have a full understanding of your condition and what the next step will be. He is a 3rd generation doctor and his reputation is very highly recognized. Dr Ricotta is worth the extra miles. "